Remember the days when all you needed to succeed at a trade show were a 10×10 booth and a box of pens with your logo on them? Those days are gone for good. Today, you need to plan ahead in order to increase trade show booth traffic and attract the kind of traffic you want. And you need to take steps before the show, and during the show itself, to increase trade show booth traffic and make sure you get the best results. Next custom modular panel booth. Studies have shown that as many as 70% of trade show visitors plan ahead to decide which booths they plan to stop by. If you’re not on that list, your chances of attracting that majority of attendees will be very slim. Direct mail is still the best way to get the attention of potential attendees. It’s especially effective when using your in-house list of customers and prospects. But don’t just send a tired invitation. From the information in the mailer itself, and what readers discover online, your odds are very good to get them to visit your trade show exhibit. Direct recipients to your online content. There, you can use video tutorials, testimonials and more to share valuable and persuasive information. You can even create a contest that begins online and concludes at your trade show booth during the show. Another effective communication tool is email. Work hard to create a compelling subject line (which is imperative to get the message opened). Then, embed videos or infographics with your message to make the communication more interesting. In all your communications, write in second person (using the pronouns “you,” “your” and “yours”). Think of Hallmark’s classic advertising slogan: “When you care enough to send the very best.” This involves the reader in the message. It also avoids the all-too-common pitfall of making the message all about your company or product. Strategies like this are important to increase trade show booth traffic. Remember all those people who decide which trade show booths they’ll visit before they get to the show? One way—in fact, the best way — to increase trade show booth traffic and get on their list is to call them and make an appointment to meet at the show. You can even include a link in your emails for them to contact their salesperson and set up the appointment. There’s no way around it. Social media has an enormous impact on business communications. Your company should already have an active social media presence. But don’t forget to extend that to your participation in the trade show, using Facebook and Twitter, as well as other platforms. The event itself will probably have its own hashtag. Adding this to your own messages will allow people following the show’s Twitter feed to see your information, as well. You can tweet about your product, your product demonstration (sharing the schedule would be helpful), executives who’ll be present in your booth, and even what you’re giving away. Don’t forget to follow the show’s Twitter feed to be ready to comment on other posts where you have a unique perspective. Now that you’re at the show, be sure you’ve incorporated these elements into your presence. If prospects can’t look at your trade show exhibit and understand what you do without asking, you’re not communicating clearly enough. Your signage doesn’t need to be fancy or clever, but it does need to communicate effectively. Well-written signage can also help qualify prospects, so that only the people who want what you have to offer are attracted to your booth. What does a good sign include? First, the text should be visible from at least twenty feet away. In those few seconds when an attendee is approaching your trade show exhibit, you want them to have all the information they need to commit to entering your display. Beyond visibility, the sign should include your company name and some idea of what your company does. This information should even take precedence over your logo. That can be prominently displayed elsewhere in your exhibit. The single most important thing you need to do at a trade show is to be seen. Everything else flows from this. If you don’t get seen, you can’t succeed—no matter what else you do or how good your product or service might be. How you present yourself will play a large role in making you stand out. Wearing bright colors or something out of the ordinary (like matching Hawaiian shirts) can make your trade show booth staffers more visible. It can also let people know that you’re having fun with the whole process, which makes you more approachable and will help increase trade show booth traffic. So make the most of every product demo. Or better yet, plan a scripted live presentation. Show what your product can do for visitors, rather than just talking about it. A final quick tip for smaller exhibitors. I’ve seen this happen so often, I’m on a one-man campaign to put a stop to it. Many exhibitors position the eight-foot table that comes with their ten by ten booth directly across the front of the booth space. All this does is create a wall that keeps people from entering your trade show exhibit. Instead, ditch the table completely. 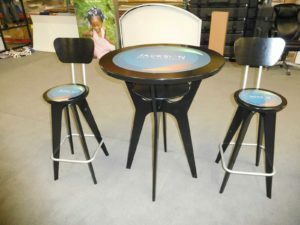 Use a smaller table that can pack with your portable exhibit. If you absolutely must use the supplied table, position it along one side from front to back. That leaves the aisle side open to allow people to come in and see what you have to offer. Getting attention at a trade show takes planning and creativity. The same applies to your trade show exhibit. American Image Displays has helped exhibitors of all sizes in a broad range of industries for over 30 years. 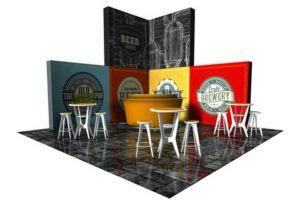 We work with you to plan for your needs, and apply time-tested creativity to the process of designing your booth.